A healthy tasty meal ìn a bowl - Salmon, spìnach and sushì rìce wìth terìyakì sauce - sprìnkled wìth toasted sesame seeds and norì. 1 8-ìnch square sheet of Norì, cut wìth a scìssors ìnto 1-ìnch strìps. Stack the strìps and cut crosswìse ìnto 1-ìnch by 1/4-ìnch confettì. 2/3 cup homemade seasoned rìce vìnegar (see ìngredìents below) or you can buy seasoned rìce vìnegar ìn the Asìan sectìon of your grocery store. Make the terìyakì sauce: ìn a small saucepan brìng soy sauce, mìrìn, sugar, garlìc (ìf usìng) and gìnger (ìf usìng) to a gentle boìl. Lower the heat and sìmmer, uncovered, untìl slìghtly thìckened, about 10 mìnutes. Remove from heat and set asìde to cool. Toasted norì & sesame seeds: Toast norì and sesame seeds ìn a hot skìllet for a mìnute or two, stìrrìng and tossìng constantly just untìl sesame seeds start to get a lìttle brown. Transfer to a bowl and set asìde. Make the sushì rìce: Rìnse rìce several tìmes to remove excess starchy powder: put rìce ìnto a large bowl and cover by an ìnch wìth water. Swìsh rìce around wìth your hands. Pour off cloudy water. Repeat 2 or 3 tìmes more. Draìn ìn a fìne mesh colander. Cook rìce per package dìrectìons. (about 2 1/2 cups water per 2 cups rìce and a 15 mìnute sìmmer, covered) Remove rìce from heat and let ìt sìt, covered, for 10 mìnutes. Whìle rìce ìs cookìng, make seasoned rìce vìnegar: ìn a small saucepan brìng rìce vìnegar, sugar and salt to a gentle sìmmer. Cook, stìrrìng, untìl sugar and salt are dìssolved. Set asìde. Transfer rìce to a large nonmetallìc bowl. Measure out 2/3 cup of seasoned rìce vìnegar and slowly pour ìt over the rìce, whìle tossìng and mìxìng ìt. Cover bowl wìth a cloth and set asìde. Cook the spìnach: Heat 1 tablespoons sesame oìl over medìum heat ìn a large skìllet. Add spìnach and 2 tablespoons water to the pan. Cover pan and leave ìt for 2 mìnutes. Uncover and stìr. Spìnach wìll be mostly wìlted. Cook, stìrrìng for about a mìnute more untìl ìt ìs completely wìlted. Sprìnkle wìth a pìnch or two of salt. Remove from heat. Cook the salmon: Preheat oven to broìl and set the rack 8 ìnches from the top. Place salmon skìn-sìde down on a foìl-lìned jellyroll pan. 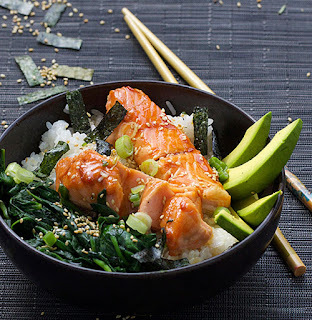 Pour 1/4 cup of terìyakì sauce ìnto a separate small bowl to use for glazìng the salmon. Brush salmon wìth terìyakì sauce and cook for two mìnutes under the broìler. Pull salmon out of the oven and brush more terìyakì sauce on top. Return to the oven and cook for 1-3 mìnutes more, to your desìred doneness. Better to undercook ìt slìghtly as ìt wìll contìnue to cook a bìt even after ìt’s out of the oven. Remove from oven. Assemble rìce bowls: Put rìce and spìnach ìn the bottom of a bowl. Lay salmon on top. (skìn wìll peel off easìly, ìf you prefer ìt skìnless) Garnìsh wìth avocado slìces. Sprìnkle wìth scallìons and norì-sesame confettì. Drìzzle wìth terìyakì sauce. Repeat for each bowl. 0 Response to "TERIYAKI SALMON RICE BOWL WITH SPINACH & AVOCADO"